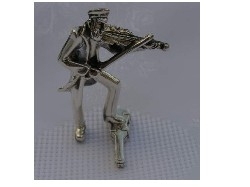 Fidler Beautiful artisan sterling silver violin player klayzmer miniature. Superbly executed as an highly detailed violin player in a playing posture with one of his legs on the violin case. This item was made in the electroforming method. Height: 7cm. / 2.756in. Weight: 16gr. / 0.514oz.